The fin is a highly technical part! Our products are continuously evolving, which keeps them at the forefront and means they are always gaining in precision. At Select, our passion has remained intact and our commitment to obtaining the best fins is total ! Today, more than ever, our fins possess a faultless technological focus. Fins are not fashion accessories: different colours, new shapes of no technical interest, and attractive serigraphy don't mean anything in terms of performance. The size of the fin is of major importance: your fin is your propeller... It transmits the energy captured by the sail and generates a push which propels your board forwards. In order for the propulsion principle to work well, your sail / board / fins' suitability must be perfect ! 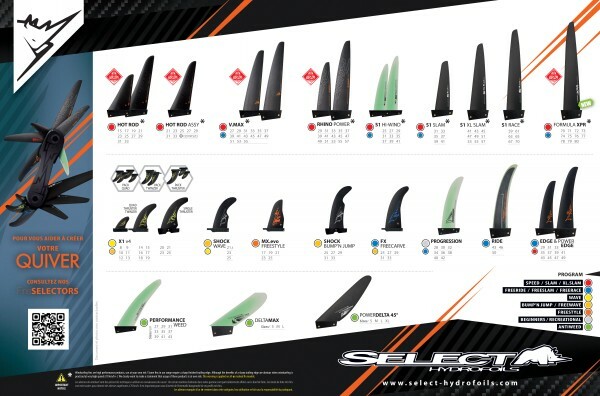 According to this consideration, we've build a set of selectors, that will guide you choosing the right fin - Please copy and paste the link below into your browser OR highlight link and Right click/Open Link to access this - To return to this page, use Go Back One Page Arrow. You can be assured that purchasing from us is safe. All our card transactions are processed securely by Worldpay & all data is secured using SSL.